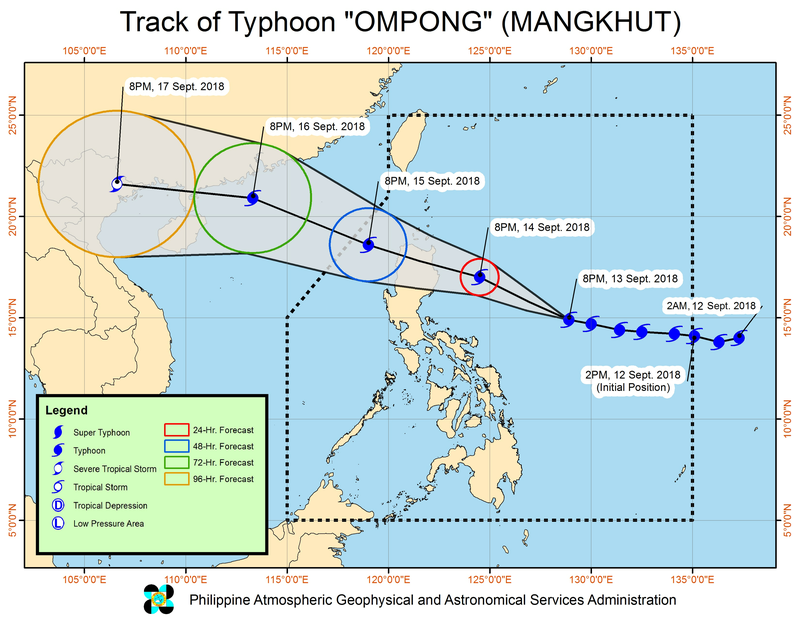 MANILA - State weather bureau PAGASA raised tropical cyclone warning signal number 2 in Isabela late Thursday night as Typhoon Ompong moved closer to Philippine landmass. Isabela may be whipped by 60-120 kilometer per hour (kph) winds within 24 hours, according to PAGASA. Tropical cyclone warning signal number 1 also remained hoisted in many parts of Luzon and the Visayas with Ompong carries a massive rain band 900 kilometers wide. In its 11 p.m. bulletin, PAGASA said Ompong has maintained its strength, packing maximum sustained winds of 205 kph and gusts of up to 255 kph. The eye of the typhoon was last located at 740 kilometers east of Infanta, Quezon or 485 kilometers east-northeast of Virac, Catanduanes. Ompong, which is expected to make landfall in Cagayan-Isabela area on Saturday, September 15, is 900 kilometers in diameter, PAGASA said. Classes have been suspended in many parts of Metro Manila, Cordillera Administrative Region, Ilocos Region, Cagayan Valley, Central Luzon, Calabarzon, Bicol Region, Central Visayas, and Eastern Visayas. Some airlines have also called off several flights to destinations in northern Luzon.